Imagine pumpkin pie and hot chocolate all mixed up together and poured into a mug and you’ve got this Pumpkin Spice Hot Chocolate. Spicy, sweet and warming! You can even make it into pudding! Welcome to Weekend Quickies–quick recipes that won’t cut into your weekend relaxation time. Today’s ridiculously easy recipe is brought to you courtesy of my last recipe, Mary’s Pumpkin Walnut Muffins, and more particularly by the half cup of pumpkin that is left over from a 15-ounce can after you make that recipe. Here’s a delicious drink that uses that leftover pumpkin and takes only about 10 minutes to prepare. Imagine pumpkin pie and hot chocolate all mixed up together and poured into a mug and you’ve got this drink. Actually, it tastes better than that sounds! It’s spicy and sweet and warming on a chilly October day. 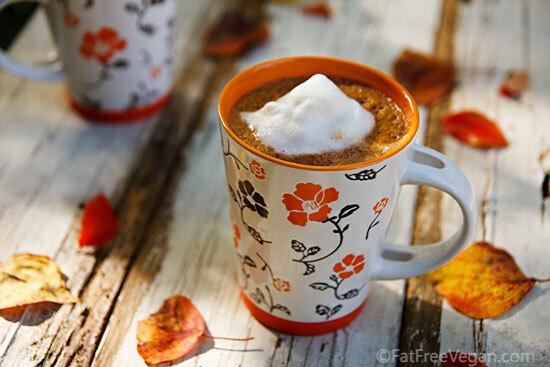 I dressed mine up with a little foamy soymilk that I whipped up with a simple milk frother. It doesn’t work well with all soymilks, but the store-brand vanilla soymilk that I used foamed up quickly and even made little whipped cream-like peaks. You may have to test several brands before you find one that foams up that thick (hint: Silk Vanilla in the aseptic boxes does not work). Also, if it’s not “curl up with a hot drink” weather in your neighborhood, you can easily turn this beverage into a pudding with the addition of cornstarch and a few extra minutes of cooking time. See the notes in the recipe for more details. I served this with a dollop of frothy soymilk on top. Combine all ingredients except sweetener in blender. Blend at medium speed until smooth. Check sweetness and add sweetener to taste; blend once more. Pour into a saucepan or microwaveable container and heat, stirring at regular intervals, until steaming. Pour into two mugs and serve. You can easily take this from a beverage to a dessert by making it into pudding. Add 2 1/2 tablespoons of cornstarch to the mixture in the blender and blend well. Heat on the stove or in the microwave, stirring constantly (or once every minute in the microwave), until it boils and thickens. Pour into 4 dessert bowls and refrigerate until set. I love your site! I just went through all the recipes all the way back to 2006, and I’ve bookmarked almost everything for future reference. You will make my transition from vegetarianism to veganism so much easier! Tomorrow is my day off, and I’m going to start on some of the cake and sweet recipes, and cook up an eggplant recipe for dinner, I’m very excited! A big thank you all the way from Holland! I made these muffins today – only change was no nuts and no raisins. Very moist and I was surprised how much they rose. Definitely a “keeper”. I used silicone cups (from Williams Sonoma) and filled them pretty full, and got all the batter in 12 (but no nuts or raisins, remember!) Only 1 small spillover. Thanks Susan! Oops I am new and left a comment on the wrong thread! I made muffins and it looks like my comment is on the wrong thread. No more comments from me wince I can’t figure it out. Sorry! Thank you so much for this delightful recipe. We don’t get many snow days in SC, but we are celebrating this one with a batch of this wonderful cocoa. We also made up a batch at Thanksgiving and added the cornstarch to turn it into pudding. Delicious! So glad you liked it! I’m happy to hear from someone in SC. I lived there for 13 years and miss it. I’m allergic to cocoa, going to try it with carob powder. My question is where can I get those mugs and is there an entire dinnerware set to go with them? they are soooooooooooo me. I bought the mugs at Pier 1, but that was over a year ago so I’m not sure if they still have them. Unfortunately, I didn’t notice if there were other matching pieces. I hope you enjoy the recipe with carob. If you get a chance, please let me know how it comes out. Hi the recipe looks great! BUT I must know where did you find those cups? They ar to die for!!!! I bought the mugs at Pier 1, but that was over a year ago so I’m not sure if they still have them. I’m curious WHERE you got your cute mugs from? Oh, Lordy! I’m making this one tonight. I think I’ll make it into pudding. Guilt free ecstacy! I just love you! Hi Susan, I’m thinking of making this at work on Halloween. I was wondering if I could “warm” this using my vitamix so than I don’t have to take the extra step (and dirty dishes to clean in the bathroom) at work. Susan….love those cups! Where did you get them? I bought them at Pier One, but they were on clearance so they probably aren’t available anymore. I just love ’em! The orange bottom part is actually a removable rubber piece that acts as a coaster. Hi Susan – I just make the pumpkin muffins to take on a road trip this weekend and was thinking pudding or what with the leftover pumpkin. 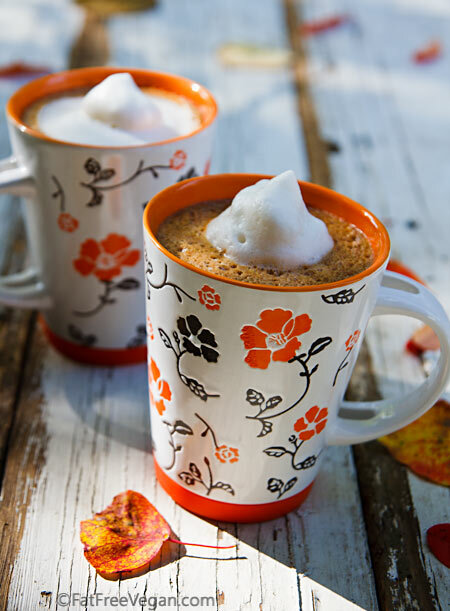 So we are going to have the pumpkin hot chocolate tonight … I remembered the recipe and the mugs from when you first published this and had to come back and find it. We are building a community of vegans and would love to have you hop over and share a recipe. Those are the most adorable mugs I’ve ever seen! Thank you! Can’t wait to try it! You have no idea how many of your recipes are now family favorites in our house–thank you for helping me learn that health cooking can taste great! Wow, definitely going to try this one! This comment is off the subject but the mugs are so dang cute. Can they be purchased? Where did they come from? Looks yummy. I was wondering what kind of milk you used (for the recipe not the froth) as it might change the nutritional info. Thanks. This is my favourite chocolate. So easy and very yummy. Oh, Susan – Just a day late with this idea to use the leftover pumpkin from the muffin recipe. I made the muffins the same day you posted the recipe (yummilicious) and then what to do with the leftover pumpkin? Well, I had Mary McDougall’s recipe for Beans and Greens soup in the fridge waiting for dinnertime, so I just added the pumpkin to the soup! Voila – delicious. Oh man! That sounds SOOO delicious!